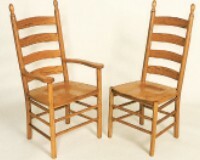 You'll find a small selection of our dining chair catalog presented below. 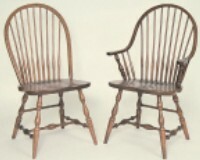 Every chair is created exclusively by Mennonite and Amish craftsmen, using time-tested techniques and designs. 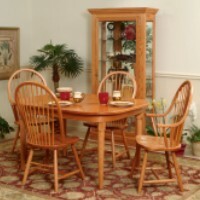 These beautiful heirloom-quality furniture pieces are constructed and finished to become even more attractive with age, and endure to become part of your legacy furniture collection. 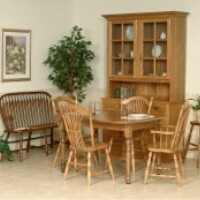 Also see our extensive selection of fine dining tables and dining room cabinets. Mennonite Furniture Studios hand-wiping stains highlight the natural beauty of the wood, and to ensure durability we apply 3 finish coats (rather than the industry standard of 2). The grain and color tone of each furniture piece will vary from our samples due to the color variation and the natural aging process of the wood. Just as the wood was created with an individual grain and color, its natural beauty will be enhanced in the years to come. 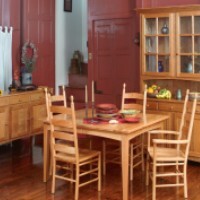 Tonal variations of reddish, brownish and paler shades are common in the red oak wood species. 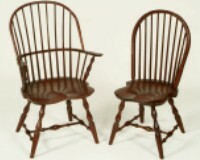 The heartwood is always darker than the sapwood, and it may have a very fine or broad pattern. Dark brown mineral streaks are common in the cherry heartwood. 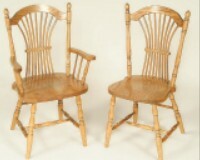 The sapwood is pale and almost white in color. 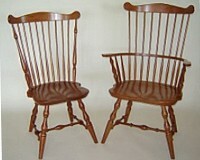 Cherry wood color deepens and grows richer with age. These natural features contribute to the unique characteristics of your furniture. Enduring value from one generation to another. The warmth that synthetics cannot give. The expression of each individual tree by its own unique color and grain. 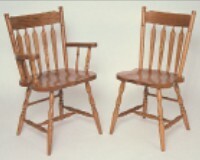 Mennonite Furniture Studios solid hardwood furniture can be repaired if damaged because there is no veneer or artificial surface that can be scraped or rubbed through. Hardwoods are a natural fiber, therefore even furniture that has a good protective finish may swell or shrink slightly from one season to another. With proper care, your furniture will give you service and satisfaction for years to come. We take lasting pleasure in custom building beautiful legacy furniture pieces that Your family can cherish for generations. 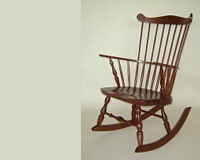 Whether You choose from our 'Classic' or 'Heritage' Heirloom Collection, every custom 'American Heirloom Furniture' piece is personally signed by the Mennonite or Amish craftsman who caringly built it, specifically for You and Your family to enjoy. What to Buy & What to Avoid!